Three Seven Marine outboard models—the Seven 527, 577s and 627sv—all with supercharged V8 power, are set to broaden the company's product line. 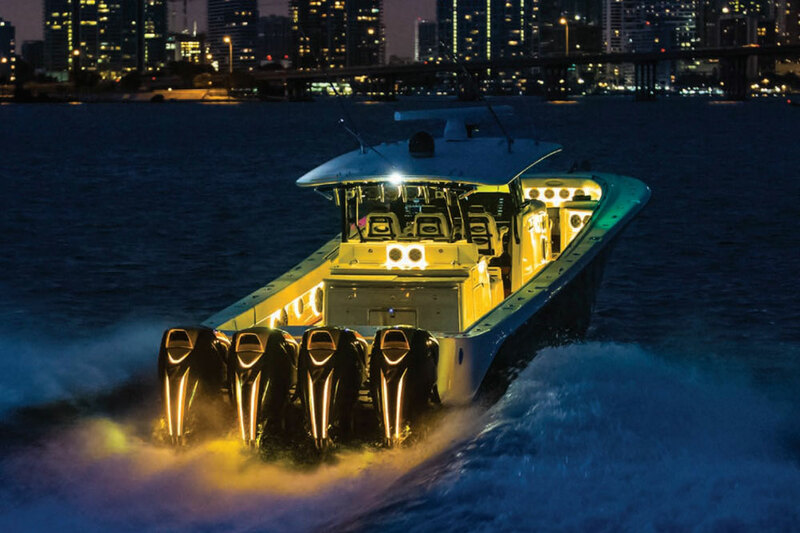 The Seven Marine outboard line has expanded to three models, each with a number of refinements under the cowl, as the Wisconsin-based manufacturer of mega-power luxury outboards notes the one-year anniversary of its partnership with Volvo Penta. The model line-up now includes the Seven 527, the Seven 577s and the Seven 627sv. In each case the model number indicates the outboard’s peak horsepower rating. The Seven 527 and Seven 577s replace the Seven 557 in the model portfolio. 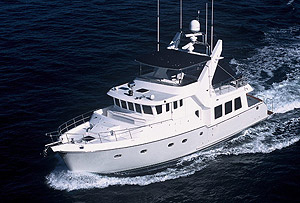 Seven Marine debuted at the Miami International Boat Show in 2011 and had its first engine in the water at that show in 2012. At its introduction the 557-hp Seven Marine prototype seemed truly outrageous. 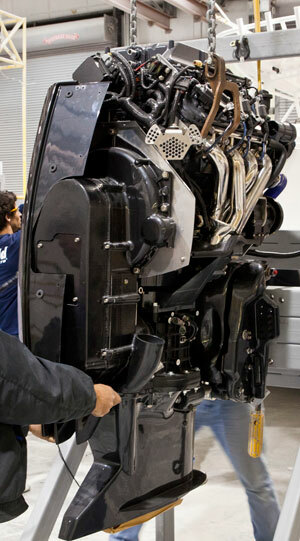 The giant outboard used a 6.2-liter supercharged V8 engine sourced from General Motors and weighed 1,000 pounds. 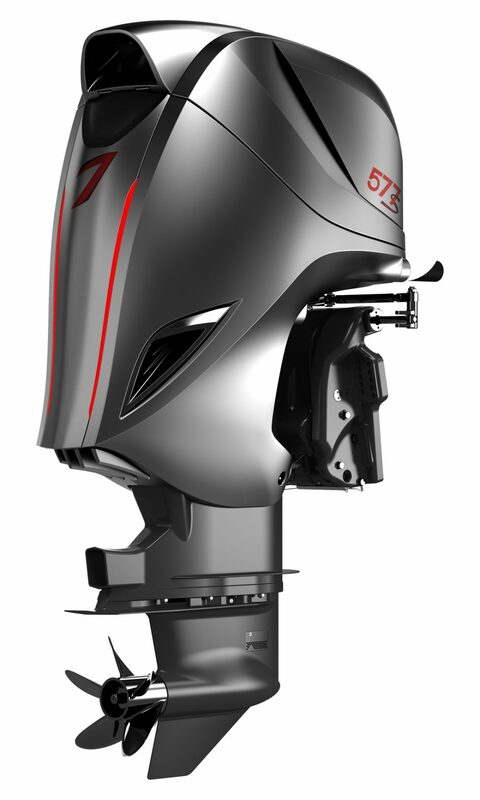 Turns out Seven Marine correctly anticipated the desire for outboard power on ever-larger and heavier boats that has since defined the market. 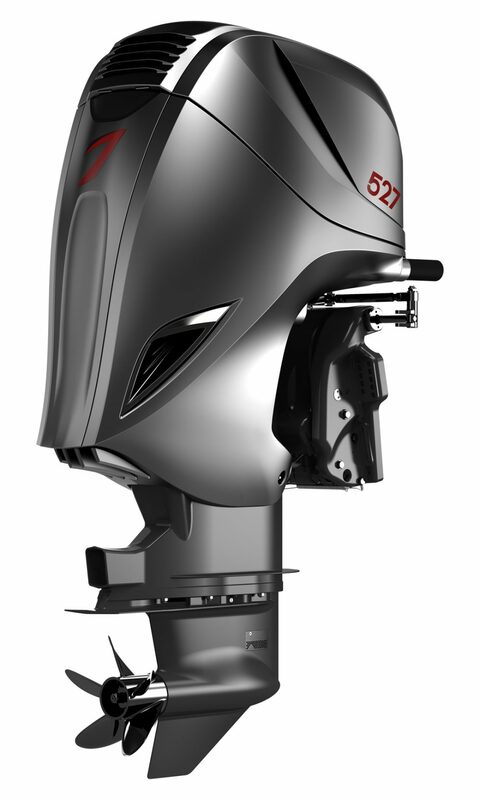 Today Mercury Marine can barely keep up with demand for its Mercury Racing 400R outboard, Yamaha just revealed a new 5.6-liter V8 425 HP XTO Offshore model, and the new 4.4-liter Suzuki DF350 features a dual-prop gearcase with generous blade area designed to move big boats. 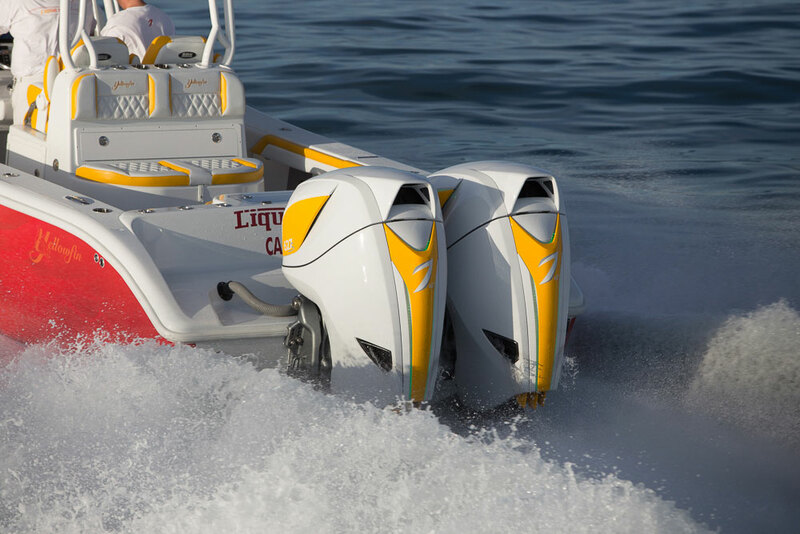 Each of three Seven Marine models continues to use the 6.2-liter GM LSA Gen IV V8 engine with a closed cooling system. Power output is determined by supercharger boost pressure and electronic engine tuning. Many of the features originally developed for the Seven 627 model, including high-performance cylinder heads and camshaft and durable Inconel exhaust valves, have trickled down the model line in what has become a standardized engine package. The engine is mated to a ZF transmission with wet-disc clutch shifting, and to a twin-pinion gearcase. A gearset between the engine and transmission is used to dial in gear ratio options. All models feature integrated power steering and can be rigged with joystick controls. The new Seven 527 is meant to make the brand more “obtainable” with a reduced price point, although since Volvo Penta acquired controlling interest in the company, Seven has stopped publishing retail pricing. The Seven 527 has a redesigned cowl that Seven says accounts for a big portion of its cost-savings effort. I was told the cowl parts makes up the second-most expensive cost element of the previous Seven models. The new Seven 527 cowl is less complex and use fewer parts, and is distinguished by a series of louvers in its top in place of the large scoop-shaped vent seen on the other Seven cowl. The Seven 527 cowl design also does not accommodate the LED lighting options offered on other Seven models, and will not be offered in the unlimited paint-and-finish options available for other Seven models. Limiting color choices helps reduce cost. The Seven 527 is equipped with a new 1.91:1 gear ratio, which Seven says allows the motor to produce outstanding torque despite being in less state of tune than its more-powerful siblings. The Seven 577s is a full-feature model that comes with SpectraLight LED lighting (rear of cowl only) and has limited color options. The bump up in peak horsepower from 557 is achieved through engine tuning. The Seven 627sv features SpectraBlade LED lighting (on the rear, top and sides) and can be ordered with unlimited custom paint color options. Note that each of these engines has a peak rpm of 6000; Seven is not achieving more power by raising engine speed. Also good to see each of these motors makes all that torque on 89-octane fuel. Seven offers three gearcase options. The standard single-prop case is rated for up to 80 mph and can be paired with three different gear ratios. The CR case features four- or five-blade contra-rotating props and four ratio options. It is designed for speeds less than 60 MPH and largest outboard boats weighing from 20,000 to 65,000 pounds. The CR offers massive blade area for lifting very heavy boats on plane and then holding those boats on plane at low speeds. The CR case also offers optimal control in low-speed maneuvering with a joystick control. The Seven GT gearcase is a semi-surface piercing design for high-speed (above 85 MPH) applications and has a bullet nose and tapered skeg. Seven has recently refined its fuel pump system to produce faster engine priming for quicker starting and updated the raw-water pump. The affiliation with Volvo Penta has produced more subtle changes, according to Seven Marine. The buying power of Volvo Penta has reduced the cost of some basic components, such as fasteners and hydraulic lines. Volvo Penta has also opened the door for Seven at new suppliers who may have previously been reluctant to work with a small company. Volvo Penta also offers Seven more-advanced testing and validation processes. European customers can soon benefit from the Seven experience. Certification for the European Union CE standard is being finalized and will be available soon for European shipments.